Beach Head 2002 Game Review - Download and Play Free Version! Control Modern Weapons and Defend Your Position Even When Outnumbered and Attacked From All Sides! You can use a variety of weapons, such as an M60 machine gun, twin barrel 30 caliber anti-aircraft gun, 75mm anti-tank cannon, a gattling gun, and a .45 handgun. Destroy or Be Destroyed in Beach Head 2002! You are the lone soldier bunkered down behind sandbags as incoming attackers storm your base. Your only option: shoot everything that moves. With the aid of an M-60 machine gun, a cannon, a Vulcan machine gun, an AA gun, some missiles, and a personal side arm, you are tasked to defend your fortification from infiltrating forces like helicopters, planes, and tanks. In this new and improved sequel to hit game Beach Head 2000, Beach Head 2002 turns your home computer into the gunner's seat with intense 3D graphics and lifelike sounds. In daytime and nighttime battles take on airplanes, Cobra helicopters, tanks paratroopers and ground forces, but watch when you annihilate them and experience bright, detailed explosions. You can use keyboard or mouse to take out the enemy and switch between your arsenal of weapons by hitting the space key. Destroying the ever-changing opposition isn't easy because the forces are constantly switching their strategy and locations. Use your missiles by hitting the M key, throw up flares with the F key and call in air bomber support by hitting the B key. You can also please your inner-maniac and hold down Right-click for continuous machine gun fire. Don't Get Bombed Into Oblivion! The incoming enemies show no mercy and will not hesitate to bomb your fort until you shake uncontrollably and run out of shields. 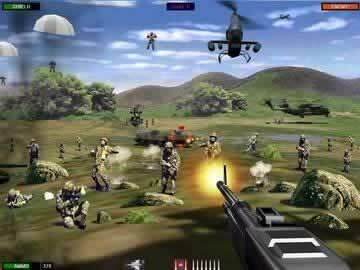 Beach Head 2002 features realistic motion and physics so you can practically feel the explosions. Beach Head 2002 is as Real As It Gets! Destroy the Attacking Forces Again and Again. Prepare to get addicted to Beach Head 2002. The sheer fire power you are in control of is cause for addiction and with Beach Head 2002's unlimited levels you are sure to replay again and again. 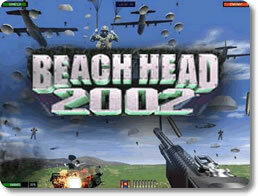 Beach Head 2002 is an arcade-style shooter where you use a variety of weapons to repel waves of enemy units as they attempt to destroy your lone bunker. You'll have a pretty awesome arsenal at your fingertips, such as an M60 machine gun, 75mm anti-tank gun, a collection of missiles, and you can even call in air strikes once you reach later levels, and with the hoards of enemy units that will come at you, you'll everything you can throw at them if you have any hope of surviving. The controls are very simple to use since you are pretty much stuck in a stationary turret and only aim with the mouse or switch weapons with the keyboard. This simple and casual game style makes this title accessible to pretty much anyone and allows you to get into the game within only a couple minutes of gameplay. Also, the graphics and audio are rather well done in some cases with the explosions from missiles, dust clouds from bombs, and the shaking of your bunker under heavy fire adding to tense atmosphere. Sadly though, the action tends to lose its luster after only a couple of levels as you realize that most of the levels are pretty much exactly the same. 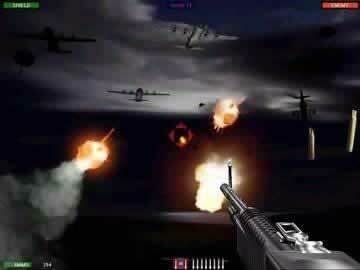 There are a few levels where things get a little more interesting, such as night missions where you have to use flares to light up the landscape and see the enemy forces or when the enemy wave consists of only fighter jets and you'll have to shoot supply boxes in order to find enough missiles to take them down. Yet, even with these few exceptions you'll most likely just be facing the same type of tanks, soldiers, helicopters, and jets on every mission with the only difference being the numbers of each type which are thrown at you. Since you are in the same bunker the terrain also doesn't change at all in the levels so you can get a bit of an idea where the enemy spawn points tend to be and prepare accordingly. Overall Beach Head 2002 adds in a few new features to this game series and presents a good looking if not terribly addicting gaming experience. There are probably a few niche gamers which will find this game a lot of fun, but most will probably lose interest after playing it a few times. If you are looking for some simple arcade-style shooting then Beach Head 2002 a great game to try out but there isn't a whole lot of re-playability to be found. Beach Head 2002 Gameplay video showing various guns and enemies you will fight.